Tottori is a small city on the cost of the Sea of Japan in western Japan. 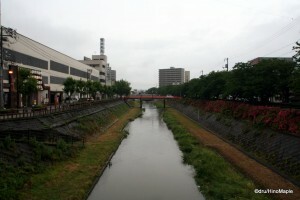 It is located north west of Kobe. The city itself is not a major location for tourists, even for Japanese people. The city has only one major reason to be. The Tottori Sand Dunes are the major attraction with Japanese pears being the major tourist gift. In general, there isn’t much to see or do in this small city, but if you are looking for a small Japanese city to visit, Tottori might be a good place to see what small Japan looks like. Personally, I think there are many better places to visit than Tottori. 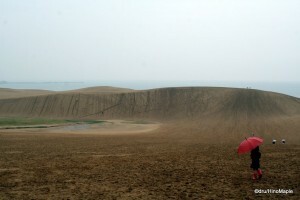 The Tottori Sand Dunes, or rather “dune” is a short bus ride from Tottori Station. It isn’t very expensive to visit the Sand Dunes and there are many things you can do. It isn’t a proper beach where you can just lye in the sun and get well tanned. It’s a tourist attraction with people walking up and down the one dune. There are several things you can do when you visit the sand dunes, but do be aware that when it’s raining, most of the activities are cancelled. One of the most interesting things you can do is to enjoy a nice ride on a camel. The price is a little steep at nearly 2000 Yen per ride, but when in your life will you ride a camel, let alone a camel in Japan! The other major attraction is to take a horse and carriage ride. These rides go rain or shine as the wagons are covered. I can’t comment on the experience as when I went it was raining somewhat heavily, so the smell of the wet horses was pungent. You can also try sand boarding, paragliding, or just take a nice walk on the beach. Since most things were closed, I decided to take a nice walk from the main station to the coast. There are three sections to the sand dune area. There’s the section between the dune and the tourist centres, the dune itself, and the coast. The area between the dune and the tourist centres has been changing over the years. In recent years, there have been grass growing at the basin, and a small pond has been growing in size. What was once a sand covered basin is now starting to change into a small green oasis in the middle of a large “beach”. The dune itself is somewhat tall and requires a little energy to climb. It’s not a difficult climb at all, but the sand doesn’t help in the ascent. Just past the dune is a steep drop that leads to the Sea of Japan. The views from the top of the dune are beautiful, if it was a sunny day, and the water is refreshing. A quick trip to the shore is recommended, if anything to get your feet wet and to enjoy the sea. The challenge of running down the dune is fun fairly easy, but one has to remember that what goes down must go up to get home. Bird Cage that's too small. Other than the sand dune, Tottori has several nice temples and touristy things around the city. If you have a chance, a bicycle is more than sufficient to get around and a great way to spend a day in the city. The loop bus would be nice as well, but I prefer to either cycle or walk around on my own. In my journey, I decided to walk and see whatever came my way. There is a nice small river that has various old bridges and sculptures lining it. I also stumbled upon a small zoo, and when I say small, I mean tiny. 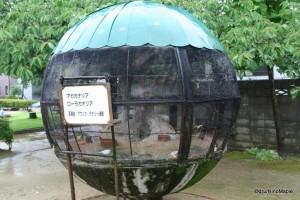 There were very small cages for animals such as goats, birds, and monkeys. The cages themselves looked too small to keep the animals happy. I arrived after 5pm, so the zoo was closed, but the entire area is encased in a park. It’s free to walk around the outside of the zoo, and the paid area of the zoo is only a single 10 metre long path that showcases, at most, a dozen or so animals. I doubt it’s worth the admission as you can easily see the animals from outside. There was nothing I could do to help the animals, and I could only hope that when the zoo was open, the animals are free to walk around the park, or a bigger area. Other than that, there really isn’t much to do in Tottori. If you go to the sand dunes, you can try to pick up a sand dune egg. These are hard boiled eggs that were cooked in the sand itself. It’s not particularly delicious, but it is “unique” to the area. I’d probably recommend trying the “ago” (ah-go). The main Japanese name is “Tobiuo” or Flying Fish. It’s a small fish that literally jumps out of the water and can fly for several metres. The main food to come from Tottori is rakkyo and Asian pears. Due to the climate and poor soil conditions, these are the only foods that Tottori can produce consistently. Rakkyo is a type of pickled onion. It’s difficult to explain, but it has a somewhat sweet taste. It’s popular as a topping for Japanese curry or as a small side dish for lunch. The pears themselves are generally in season towards the end of summer. Any other time, you’d only get pear treats rather than fresh pears themselves. If you do go to Tottori, I highly recommend renting a car. 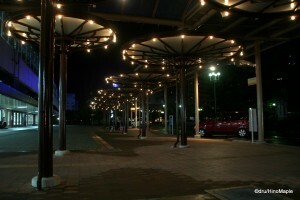 Tottori city can be visited in a day, maybe two, but if you want to really see the area, a car is a must. 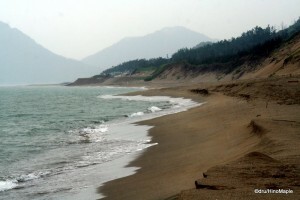 There are various beautiful beaches just outside of the city towards the west. You can also head towards Mt. Daisen which is a large mountain that is considered to be the Mt. Fuji of the area. Another great option is to take the San’in Railroad, run by the JR Company. I have heard it’s a beautiful train that goes up along the coast. You can enjoy a beautiful day going from Kyoto all the way up to Tottori, then over and along the coast. If you have the time, and want to just enjoy a day as the world passes by, this is a good way to spend it. This entry was posted in Chugoku and tagged ago, beach, camel, Daisen, flying fish, japan, kyoto, Mt. Daisen, oasis, paragliding, rakkyo, San'in, San'in Railroad, sand boarding, Sand Dunes, Sea of Japan, Tobiuo, Tottori, Tottori Sakyu, Tottori Sand Dunes, Tottori-ken, Tottori-shi, western Japan, Zoo, とびうお, アゴ, 京都, 大山, 日本, 鳥取, 鳥取市, 鳥取県 by Dru. Bookmark the permalink. hello! i just found your blog as i was planning to travel to Tottori soon. i LOLed at the part about running down the dunes ^^ Plan to slowly read through your blog and digest all the wonderful info! thanks! Glad this is helpful. Tottori is a wonderful place. I don’t think I visited enough of the prefecture or the city to really give it a good review, but a car is recommended. Glad you got a good laugh out of the trip down the dune. 😉 You laugh, and I cried thinking about returning up the dune to get back. 😀 Honestly, it was a lot of fun and I would do it again.